I started following Sarah’s blog this year, and she’s hosting her first quilt along. She’s posting the fabric cutting instructions on Monday, so it’s not too late to do a quick stash pull and join in. I’m keeping my colors simple with a graphic print, a subtle texture, and a solid. As long as I keep up with the schedule, I should be celebrating a finish on this quilt by the end of February. This month, I’m taking part in my first blog hop. The Wake up to Kona hop starts on the 7th, and my big day for the reveal is on the 17th. Since it’s a hop, I have to mostly keep things under wraps other than to tell you what pattern I’m using below and to entice you to drop by to see the quilt later by showing you how pretty even the trimmings are. I’ve got about 1/3 of the piecing done so far. This year I want to start linking up to A Lovely Year of Finishes since that party seems to motivate so many people. Finishing this quilt seems like the perfect goal because it has to get done, and it will be nice to celebrate its completion. I’m working on turning my first pattern concept into an actual pattern. In fact, this is the pattern that I’m using for the solids blog hop, but I think I can make it jelly roll friendly, so before I look for some pattern testers, I want to make the quilt using a jelly roll also. Since I love my finished star surround quilt so much, I can’t resist gearing up for Melissa’s next quilt along – Star Light, Star Bright. I’m going to do the giant one block version again. I haven’t picked the colors quite yet, but Melissa’s going to start posting details at the end of the month, so I should start dreaming up some color schemes while I clean up my sewing space. Talking about Melissa’s blog brings me to my next quilt on the list. When she posted her new In Your Neighborhood quilt earlier this year, I bought the pattern. And, if I’m buying these patterns, I’d better make them right? So, starting later this month, here I go! The book is on its way to me in the mail as we speak. I’ll probably complete some blocks and then just set them off to the side due to time constraints and turn some of the blocks into smaller table runner projects. I might not even make it through all 20 blocks (but I’m hoping I do). As I go, I want to pick 2 of the blocks and let them grow into quilts before the year is out. 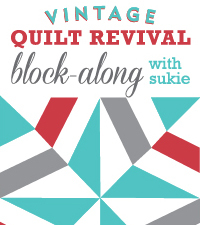 One of the vintage revival quilts is going to count towards my Library Project Quilt Along goals. And, I’ll also be making 2 flannel quilts out of one of the books that I have languishing up in my quilting room. I already bought all the flannel, and it is taking up so.much.space. Obviously, the solution for that is to make it into quilts that someone can love. That’s probably enough quilt goal setting for one day, so I’ll post goals 10-17 soon. Plus, this post gives my fellow quilting friends who can be convinced to squeeze in one more project some quilt alongs to go check out. If you decide to join in on any of them, let me know. I want to see what you’re creating. What a goal you have set for yourself!! good luck!!! I’m on Jan 10th for the Kona Blog Hop!!! See you on the 17th!! Love your pattern, can’t wait to see the quilt in solids!! I missed Melissa’s new QAL, gonna check that out. Wanted to do Sarah’s too, but will just have to follow along because I’m a little overbooked:) See ya in the hop! Looks like you have some fun stuff planned. I wish you a great and productive 2014!